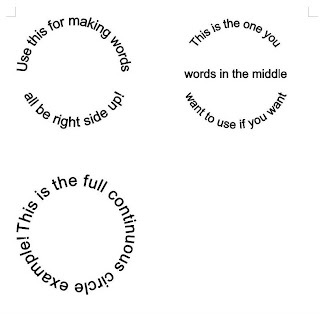 I have had questions on how to do the word cirles in Microsoft word so I thought I would post CIRCLE TEXT ART EXAMPLES that you can download and edit to your desire. DCDOLL showed me how to do the circle text at first, at least I think it was her. Anyway there are three examples on this file, as show in the picture. Once you have one done that you like you can copy and paste it so you can print more than one. I just used Arial for the font so it would open easy since it is a standard MS word font. You can adjust the font style, size and color to your liking. It might take some time playing with it to see what you want to use but at least you can always save the files for later use. There are other shapes to use but for now I just thought I would do the circle examples. I think these are great to use with circle punches. I just love circle sentiments!! I was asked how to change the color of the text and thought I would post the contents of the email I send the lady that inquired. These should help if you are wanting to play around and not sure how. 4. if you want an outline color then click on the FILL color and choose your color. This will leave the outline to be a different color. You can also do textures or patterns, all those options are in with the color editing box. 1. double click on the text box and a box will pop up. 3. Choose the font while the box is up and then click okay. I am not always the best in writing instructions but hope these help! WOW!Thank you for sharing this! I have always had difficulty keeping the circle circlish. (is that a word?) and this will help tremendously!! thank you! This will come in so handy! You are just sooo sweet to share. Thank you so much for all of your help Okie..
U SO good U make Peoples life so much easier.. THANK U!! You crack me up. You have so much energy and you are very creative. I love your sense of humor and the way you laugh at yourself. Thanks for sharing all of your cut files. Do you use SCAL at all? Thanks for sharing! It will make life so much easier. Thanks so very much. I agree, it will make life EASIER!!!!!! Whoa! Thanks, Okie. I've been doing some cirle sentiments and was pretty proud of myself but they all were the full, continuous circle. Some of my friends don't like to stand on thier head to read the cards, so the varieties are great! Thank you for sharing these and all the other wonderful work you do. You are da BOMB!!! Thanks so much for this!! THANK YOU THANK YOU THANK YOU! I am a Word dummy and really wanted this, so thanks again Sweetie Pie! Wow you are so amazing I have discovered you by accident doing a google search for my sisters card hence circle text, I have been pulling my hair out. Thank you so much I am now a follower and will read all you blog in a little while this has been every so helpful and it was easy to follow with your instructions. Thanks for sharing. This has SO MANY uses. I can not seem to find WORD ART on my program. Is my program too old? I just love the circle text you did and think it would be great on cards, etc. Is there a certain version of Microsoft Word that you are using?